Playtime’s over, soldier! It’s time for some real fast paced tower defense / tower defence action. Lucky for you, Generals has you covered. Forget about castles and clans — jump into epic td combat, take command of powerful vehicles, hone your strategy skills and become the ultimate commander of your army to win any World War II battle. 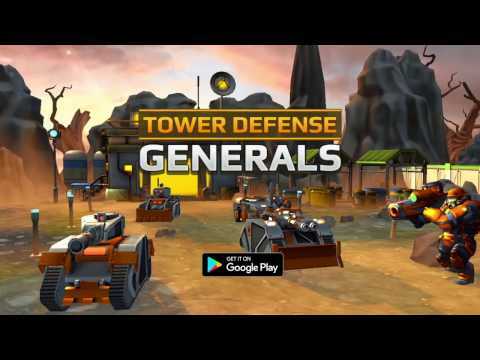 Tower Defense Generals is one of the most engaging TD games available on mobile! Get ready for an epic battle to defend your colony against hordes of armored cars, tanks, battle drones and other dangerous enemies using a vast arsenal of towers and deadly weapons at your command! Fight in the desert, in frozen areas and wastelands, customizing your defensive strategy with different tower upgrades and specializations. Rain fire upon your enemies, summon reinforcements, command your troops, recruit generals and face legendary bosses on a quest to save the colonies from enemy invasion! ★ 26 exciting levels to master. ★ Multiple episodes in varying environments, each with unique gameplay challenges. ★ 12 powerful towers, including laser gun, missile launcher, machine gun and vehicle support. The ultimate TD arsenal! ★ 20 different military enemies with unique abilities and weaknesses. ★ Legendary generals. Each has unique specialties that fit different play styles! ★ Upgrade system allows you to min/max your towers towards your preferred strategy. ★ Three difficulty modes to challenge your tactical skills to the limit. ★ High definition 3D graphics and special effects. ★ Optimized for Android phones and tablets.